America was recently shocked by yet another tragedy of an unprovoked gun attack on innocent victims. What made the Newtown, Connecticut, massacre particularly sickening and sad is that 20 of its 27 victims were young children aged 6-7 years. The widespread gun ownership in the USA is often and logically linked to such mass murders. In this article I argue that gun ownership is itself a symptom of a more fundamental culture of violence that expresses itself not only nationally across the USA but also on the international stage. The killer — a deranged man — of this massacre did not have any difficulty finding the weapons he needed to commit this mass murder. His mother, like many Americans, was a gun owner. She, who became one of his victims, kept multiple weapons and plenty of ammunition. One interesting observation is that the rate in the USA is 1.5 that in Serbia, which has recently been involved in a civil-war, and Yemen, which is still torn by civil war. The number of guns for every 100 persons in America is more than 2.5 that of Iraq — a country that is still recovering from a devastating war and pretty much still ruled more by militias than law. The rate of gun ownership does not necessarily have a proportional correlation with fatal violence. For instance, the 2011 Global Study on Homicide by the United Nations Office on Drugs and Crime shows that the percentage of homicide by firearms in the USA was 60%, whereas another 25 countries had much higher figures, including Guatemala 84%, Honduras 83.4%, Colombia 81.1%, and Panama 75%. 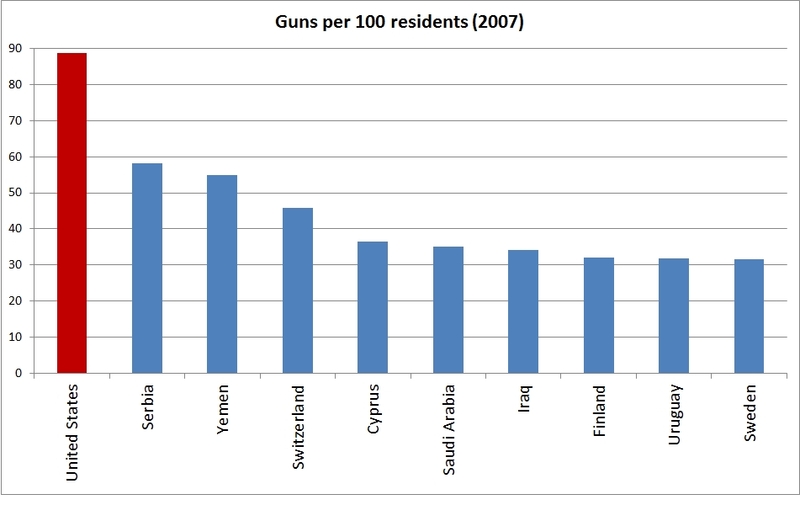 A higher percentage of the murders in those other countries were committed with firearms, even though there are more weapons per person in the USA. But the fact that the correlation between the rate of gun ownership and homicide by firearms is not proportional does not mean there is no correlation. No sensible person would deny the link between the existence of 370 million firearms in the hand of civilians in the USA and the occurrence of tragedies such as that of Newtown. Less weapons would have meant less dead victims. An insane or very angry individual who is bent on killing people would try to do that with whatever weapon they can get hold of, but they can cause a lot more death if they had firearms. But surely what is “necessary to the security of a free state” in the USA has completely changed since the Second Amendment was adopted in 1791. No one in their right mind would argue that security of the individual in the USA or the state itself is today protected by the guns owned by civilians. But when people believe something to be a right they are entitled to, justifying it can become secondary, with different people justifying it differently. 68% of those gun owners who took part in the poll believe that gun ownership helps to “protect people from being victims.” This self-image of being a law enforcer is particularly scary. It is a serious problem for any country when civilian citizens view themselves as some kind of police and believe that they have the right to take the law in their own hands. But when this country is America, this national problem has the potential of taking an international dimension. America’s military might allows it to behave as the self-appointed police of the world, if it wants. Unfortunately for the world, it has always done. I see clear similarity between how gun ownership in America is in effect seen as a way of self-appointed policing and America’s behaviour on the international stage as the self-appointed police of the world. The gun ownership culture in America is not something that the rest of the world can view as a local issue; it has consistently and persistently spilled outside the USA borders, to the farthest corners of the world. This is the fundamental problem I have with the mindset underlying the gun ownership culture in America. It does not only allow deranged individuals to kill masses of innocent Americans, including children. It also contributes to allowing a power- and control-driven America to kill masses of innocent non-Americans, including children. The term “war” is usually used as a justification. Using the more emotive name of “war on terror” was intended to make the violence look even more justified and convincing. Yes we need gun laws & better mental health care. BUT even that won’t stop the killings. Because, let’s face it, America believes in killing. A country that officially sanctions horrific violence (invade Iraq, drones kill kids, death penalty) is surprised when a 20-yr old joins in? I hate to say it, but killing is our way. We began America with genocide, then built it with slaves. The shootings will continue — it’s who we are. The long term solution to reducing gun deaths is to change our society from one of perpetual war and fear to one of peace and tolerance. The short term solution? A law immediately banning semi-automatic weapons & mega-clips. Must have license to own gun. Must pass mental exam. Also, end the U.S.-sanctioned policy of killing: End the wars NOW, end death penalty. Stop banks and insurance companies from destroying people. It’s all violence & it’s all connected. Why does this happen only in America? The answer is right in front of you. And it’s not just the guns. I agree with Moore that too many Americans think that violence and exercising power is the answer to just about anything. This was epitomized by the response of the National Rifle Association to the shooting in Newtown. Its chief had no problem at all declaring that “the only way to stop a bad guy with a gun is a good guy with a gun.” His solution to stop such massacres of young children? Putting armed guards in schools! America just cannot think much outside violence; certainly not when it comes to foreign policy and certain foreign countries. Not even the intellectual Obama could break away from this long American tradition. Not much changed from Bush’s days. The drones that killed thousands of innocent people, including numerous children, the detention in Guantanamo Bay, the support for the Israeli savage policies …etc. His only real achievement is to not have started a brand new war, yet. America consistently fails to see that it often uses violence as a replacement for rationalism and realism. When the U.S. Consulate in Benghazi was attached and four Americans, including the Ambassador, were killed, Obama deployed two Navy guided missile destroyers off the coast of Libya. Given the chaos in Libya, the fact that there is no credible way of linking the attack to any localized individuals or group that may be targeted, and the fact that these destroyers could not prevent such sudden, small-scale violence from taking place, and so nothing was being achieved by this deployment, the move just shows how American politicians think violence even when it is meaningless and completely ineffective. Let’s “show them our power,” “tell them what damage we can inflict,” and similar reminders of violence are often the short-, medium-, and long-term answers to problems America faces. The underlying assumptions are that the violence out there is unjustified, it can only be stopped by violence, and American violence is justified. American violence is always seen as a response even when it is clearly the trigger that started violence. America needs to do something serious about its gun ownership culture, but more importantly about the underlying tendency to use violence, of which gun ownership is a symptom. When it succeeds, not only Americans will benefit, but the whole world will feel the change and celebrate. Tagged Gun Ownership, USA, Violence. Bookmark the permalink. I believe that no military person should serve more than 300 kilometers beyond his or her national borders. No military person should be required to serve in a UN peacekeeping mission, but that a military person who volunteers to serve on a UN humanitarian aid mission, be granted temporary duty to serve as such. This verse is to every single muslim. For some reason you did not include states that had the highest rate of gun ownership.